A car should possess the best features; don’t you agree? You see a lot of innovations and ideas in the automobile industry nowadays. And every brand tries to outdo another. 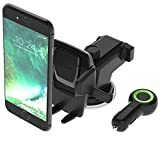 Here is Best Car Phone Mounts. You’re not here to read about cars. You’re here to know about the best car phone mounts. Of course, cars nowadays come equipped with touchscreen panels that have integrated systems to take calls, send messages, and a bunch of other functions. But where does that leave your phone? In your pocket? On the dashboard? To uncomplicate your search for the best phone mount, here’s a list of 10, consumers swear by. 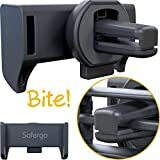 The Safergo phone mount has a tiger teeth metal clip made of zinc alloy that grips the air vent so that you can mount your phone securely. You can conveniently place devices ranging between 3.5 to 6 inches in width without having to worry about it falling off on bumpy roads. You get a 360-degree rotation as well with the option of mounting it on vertical or horizontal air ducts. One drawback of this phone mount is that it cannot be placed on air vents that have slats bigger than 0.79 inches. In many ways, this phone mount is way above the rest of the competition. Firstly, it comes with an easy one touch mounting system that envelops your device with ease. Releasing the device is easy as well. At just the push of a button, the device pops out without any scratches. There is also a sticky gel pad on the bottom that can stick to any surface, including textured. Amazingly, this gel pad can be rinsed and dried which returns it to its out-of-the-box condition. You also get a 360-degree rotation, with grips that can secure devices upto 2.9 inches wide. Magnets are cool, aren’t they? 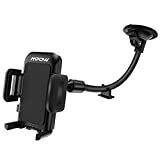 This phone mount has one; powerful in fact so that your device is glued on. It also has a sturdy rubberized-base that can be slipped into an air vent. This base is also pretty strong as it upholds the weight of the magnet and your device. To get this mount up and running, simply let it lock on the air vent. To place a phone you’ll have to insert a metal plate between the protection film and your phone, stick the metal plate on the phone’s rear, or opt for a phone case with an embedded metal plate. The Koomus Pro phone mount is a handy little beauty. It slips into your CD slot on the push of a button. Removing it will also require you to push the same. Moreover, the entire mount is covered in silicone so that neither your car nor your device develops scratches. As with all magnetic mounts, you’ll have to either opt for a metal-plated phone cover or stick the metal plate onto the rear. The 360-degree rotation on this phone mount offers tremendous viewing angles. This phone mount stands out as compared to other similar products, but unlike the others, it blends in perfectly. Two is always better than one. 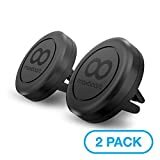 That’s right, you get two of these mounts in a pack for your air vents. These phone mounts have 4 powerful magnets and a sturdy base so that your devices don’t slip, fall, or wobble on the worst roads. 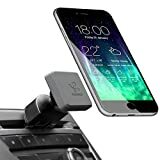 The magnetic mount on the base has a tremendous attractive force that latches on to devices of any make: Android, iPhone, Windows, or Blackberry. You also get a rotation and swivel motion for portrait or landscape views without you having to worry about your vents’ slats moving around or your device losing grip.